The following is a letter to Greater Sudbury's Operations Committee regarding a request for a decision on pedestrian traffic signals requested by two community organizations and Greater Sudbury utilities, for a location on Regent Street, midway between intersections at Ontario Street and McLeod/Hyland streets. A copy of the City of Greater Sudbury's Manager's Report to the Operations Committee is available here. Sudbury Moves has an excellent time-lapse video which shows people (most of whom appear to be employees of Greater Sudbury Utilities) using this crossing one winter morning. It's available here. I am writing to you today with regards to an item appearing on your Committee's agenda pertaining to a request for a pedestrian traffic signal on Regent Street, near the location where Regent Street traverses over Junction Creek. 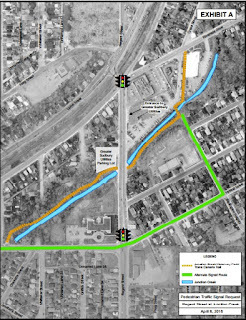 According to the Staff Report in front of you today in support of the Draft Resolution, this request for a signalized pedestrian crossing comes from Rainbow Routes Association, Connect the Creek Partnership, and Greater Sudbury Utilities (GSU). I sincerely hope that you will take a moment prior to any vote at today's Committee meeting to consider these comments. While the City appears to have been approached by local trail organizations and the GSU to consider a pedestrian crossing, there appears to be considerable disconnect between what was requested of the City and the City's proposed response to that request. It is apparent that concerns were raised with the City by the trail organizations and GSU with regards to the safety of pedestrians and cyclists with crossing Regent Street at this location. After what appears to have been several years worth of consideration since the original submission, the City's proposed solution to this safety issue appears to be one which does absolutely nothing to make the current situation safer for users of the Junction Creek trail or GSU employees. Posting signs urging pedestrians to travel more than 400 metres out of their way just to cross the road is not a safe – or sensible – solution to a matter of health and safety. These signs will do little or nothing to change pedestrian behaviour in this location. As the Staff Report points out in a different context, pedestrians “do not go out of their way to use traffic signals to cross the road.” With this in mind, there seems to be a significant disconnect between the City's solution (posting signs to advise pedestrians to use traffic signals located about 200 metres away to cross the street) and the observed and expected behaviour of pedestrians who desire to simply cross the street in this location. Even after the installation of signs in this location, we can expect pedestrians to continue to cross the road here – to get to work, and to continue their journey along the trail. With this in mind, wouldn't it make more sense to find a solution to the on-going safety issue which is likely to lead to a situation of greater safety? While the Staff Report does not indicate when the request for a crossing was submitted to the City, it can be surmised that it was at some point prior to June 10, 2014 – the date that the City conducted a pedestrian and cyclist count at this location. That means that the City has had this request before it for a period of approximately two and a half years, if not more. It appears that during the past two and a half years, the City has not attempted to engage the public in any way, shape or form with regards to this request for a crossing. If opportunities were made to engage the public, it may be that I missed them – but I find it unlikely that there would be no reference to public engagement in the Staff Report had it occurred. I find the lack of public engagement troubling. Why did the City choose not to consult with the very people who would be impacted by this decision – specifically, those who are currently crossing Regent Street to access the trail, or to simply get to work every day? It may have been that, after engaging with the public, alternative solutions to a signalized crossing might have been proposed, and a consensus on a finding a safe way forward might have resulted. Further, had the City actively sought the input of the public on this matter prior to the preparation of its Staff Report, I doubt very much that I would be writing this letter to you, alerted to this issue as I was by a media article about the Staff Report. I regret this last minute submission, however this matter has only came to my attention on Friday, December 2nd. Pedestrian counts in unsignalized locations are always going to be impacted by the fact that pedestrians are choosing not to use facilities like the trail in this location because of the perceived unsafe crossing. For example, I am a user of the Junction Creek trail in and around this location, yet I refrain as best as I can from using the portion of the trail between Riverside Drive and MacLeod Street because of the unsafe crossing across Regent Street. While I might be able to dodge vehicles in a manner similar to what GSU employees appear to have to go through every day just to get to work, when I have my three small children in tow, crossing Regent at the trail simply isn't an option. That means that my family and I are deprived of the joy of using the trail, and are forced to walk along busy streets which are less friendly environments for children – and indeed for all pedestrians. If there were a way to cross Regent Street more safely at this location, I suspect that there would be more people crossing the street. While I understand the provisions of OTM Books 12 and 15 are being followed here, it is hard to imagine that more people wouldn't cross the road if they could do so safely. Therefore denying the creation of a safe crossing point because not enough people are using the crossing out of concerns related to safety seems to be, to say the least, perverse. Not only is the trail in this location a part of the Junction Creek Waterway Part – it's also a part of the Trans Canada Trail – a trail that stretches across the entirety of our nation. Increasingly, trails like the Trans Canada trail are attracting tourists to communities which are lucky enough to be located along the trails. It has been an on-going goal for the past several decades to connect various sections of the Trans Canada Trail so that trail users are exposed to a minimum of interactions with motorized vehicular traffic. Not only does segregating trail user from motorized traffic lead to a safer circumstance for trail users, it leads to a more pleasant trail experience – one more likely to be replicated by others. Posting signs that encourage pedestrians to cross the street at signalized intersections 200 metres away from the trail is not at all in keeping with a desire to connect the trail – and indeed, it appears that the City will be going out of its way to make life more difficult for trail users. I understand that there are concerns with regards to the potential for northbound traffic to back-up into the Regent/McLeod-Hyland intersection because pedestrians are utilizing a signalized crossing to safely traverse the street at some point mid-way between McLeod-Hyland and Ontario Street. The Staff Report rightly points out that it is illegal for motorists to block an intersection. Speaking as a motorist, I believe that we can rely on motorists to follow the rules of the road in a majority of situations that they find themselves in. This includes not entering an intersection when there is no possibility to clear the intersection prior to the light turning. That there will be some motorists who, for whatever reason, choose not to follow the rules of the road, is not a rationale to refuse to install facilities for pedestrians to use to safely cross the road. For consideration, the City recently installed a pedestrian crossover on Brady Street at the Shaughnessy Street intersection. Brady Street is classified as a Primary Arterial in the City's Official Plan (while Regent Street in the location of Junction Creek is classified as a Secondary Arterial), and as such, we can expect that traffic volumes along Brady are some of the highest in the City. The intersection of Brady/Shaugnessy is less than 100 metres west of the Brady/Paris Street intersection, arguably one of Greater Sudbury's highest volume intersections. It's also less than 100 metres from the Brady/Lisgar intersection. If the City were really concerned about the behaviour of motorists blocking intersections as a rationale for refusing to install safe crossings for pedestrians, it is highly unlikely that the City would have ever installed a pedestrian crossover at this location on Brady Street, no matter whether it was warranted. Public consultation might have revealed that there may be alternative design elements which could be built into a safe pedestrian crossing at this location. Design elements such as a crossover with a pedestrian island refuge mid-street would lessen concerns about traffic backing up through intersections, as motorists must only wait for pedestrians to clear the crossover between the sidewalk and the island, rather than to clear the crossover in its entirety (which would take twice as long if traversing an equal number of lanes, which is the case on Regent Street). Yes, there would have been an additional cost to install an island in this location, but at the very least, the City should have explored this option (and likely other options) with those directly impacted by the request for a safe crossing. My request to Operations Committee is to put this matter on hold, and direct Staff through Council to engage with trail users, GSU employees and the public at large, on a way forward to create a safe crossing for pedestrians who are, and will continue to, cross Regent Street at the location. Public engagement may reveal sensible alternatives which address the safety needs of pedestrians along with any perceived issues which may affect motorists in this location. Please keep in mind that pedestrians will continue to cross here without a signalized crossing, putting their lives at risk just to follow a trail or to get to and from work. It is unreasonable to believe that pedestrians will detour the distance of four football fields to arrive at a point directly in front of where they started, just tens of metres away. It's not happening now (although some, like me, are avoiding this area all together), and it won't happen in the future. Let's acknowledge this issue and resolve it in a way that leads to a positive community building outcome. Let's make sure that people have a safe way to get across the street at this crossing.